Love burns. Worlds collide. Magic reigns. This world is trying to kill Lily Proctor. Her life-threatening allergies keep her from enjoying many of the experiences that other teenagers take for granted...which is why she is determined to enjoy her first (and perhaps only) high-school party. But Lily's life never goes according to plan, and after a humiliating incident in front of half her graduating class Lily wishes she could just disappear. Suddenly Lily is in a different Salem - one overrun with horrifying creatures and ruled by powerful women called Crucibles. Strongest and cruellest of all the Crucibles is Lillian ...Lily's identical other self in this alternate universe. This new version of her world is terrifyingly sensual, and Lily is soon overwhelmed by new experiences. Lily realizes that what makes her weak at home is exactly what makes her extraordinary in New Salem. It also puts her life in danger. Thrown into a world she doesn't understand, Lily is torn between responsibilities she can't hope to shoulder alone, and a love she never expected. But how can Lily be the saviour of this world when she is literally her own worst enemy? 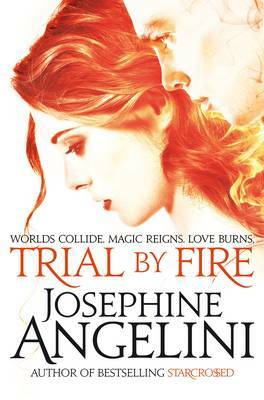 Trial by Fire is a sensational, page-turning adventure from the bestselling author of Starcrossed, Josephine Angelini. A strikingly original take on the ideas of magic and science with a great sideline in parallel universes; if you like beautifully rendered magical theory, this is the book for you.